The Resident Tourist: Hot & Cold . . . Hot & Cold . . . So sorry for the silence last week. I had a bit of blogger's block and a stubborn case of the sniffles, so I spent most of the week sipping tea and focusing on kicking the cold. Whenever I feel sick (especially with a sore throat), I always reach for a cup of chamomile tea with honey. It's fragrant, sweet, and (at least momentarily) soothing. But let's be honest, hot tea is never that appealing in the middle of summer. So on the extra warm days I tried a variation of my go-to over ice with a squeeze of fresh orange for flavor and little added Vitamin C. Delicious! A new summertime favorite. 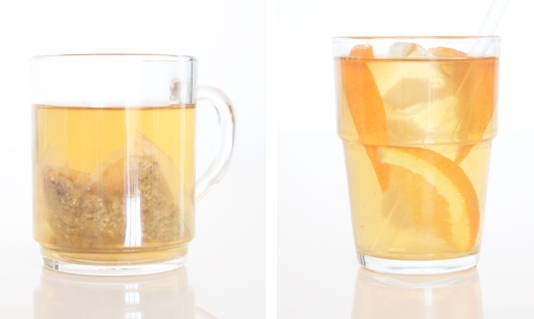 It's inspired me to experiment with other tea/fruit combos throughout the rest of the season. I'm thinking lemon verbena tea with muddled blueberries, green tea with lime and mint, or even ginger tea with peaches and agave nectar. Yum, right? Give them a try, let me know what you think! Happy Labor Day Weekend . . .
2013 U.S. Open . . .
Taco Tuesday . . . Morning Mix . . .
Las Vegas Top Threes . . . The Carlyle Photo Journal . . . Weekend Must: Summer Streets . . .
End of Summer List . . .
New York Restaurant Week . . .